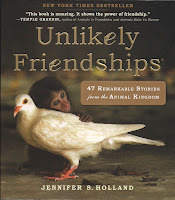 Recently, I read this book entitled Unlikely Friendships by Jennifer Holland, writer for National Geographic magazine. There are nearly 50 stories of animals who become unlikely friends. From an African elephant and a sheep to the owlet and a greyhound, accounts of varied animal species demonstrating unexpected compassion and friendship spill across the pages, not to mention beautiful photography. One story included of a baby hippo and a 130 year old tortoise made the rounds on Facebook a few years ago! They actually have their own book, Owen and Mzee, A True Story of a Remarkable Friendship. In her observations, Barbara King, animal behaviorist, describes Owen's and Mzee's mutual communication as sophisticated, "It's a dynamic dance between two species with no present program on how to deal with each other. 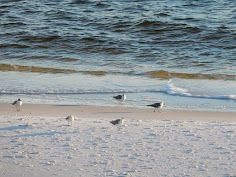 And it can't just be instinct, because one was shaping its behavior to the other."